Karissa Lee Staples plays Invi in Kingdom Hearts X [chi] Back Cover! A few weeks back, it was discovered that Michael Johnston plays Ephemera in Kingdom Hearts X [chi] Back Cover following the release of the E3 2016 trailer for Kingdom Hearts HD 2.8 Final Chapter Prologue. Dedicated fans have been trying to discover the voice actors of the other characters in Back Cover are to very little success, but today it was discovered that Karissa Lee Staples is voicing Master Invi in Kingdom Hearts X [chi] Back Cover. 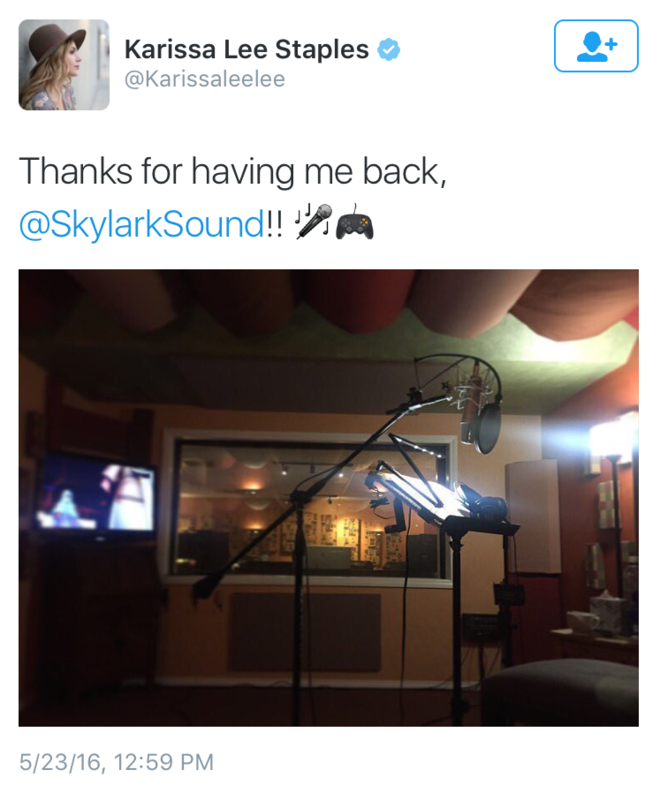 Back in May, Karissa Lee Staples revealed on her Twitter that she was recording for a video game project and in the photo she took, you can see Master Invi talking to Master Aced on the screen in the recording booth. Staples has played many roles in different projects over the years including 90210, The Lottery, Final Fantasy Type-0, and The 3rd Birthday. Follow Kingdom Hearts Insider on Facebook, Twitter, and Tumblr for the latest updates on Kingdom Hearts Unchained X, Kingdom Hearts 3, Kingdom Hearts HD 2.8 Final Chapter Prologue and all things Kingdom Hearts! Visit our forums and discuss all of the latest news! Interesting. Well, I can't wait to find out who plays Master Ava! Ah, my leader. Both are pretty ladies as they should be. Awesomes. So that's two voice actors confirmed! Yay! I love how once we finally figure out who voices these new characters, it turns out they already announced they were a part of it a month or more beforehand. Never heard of her, but she has a great voice! I still believe that Master of Masters is Chris Evans! CAPTAIN AMERICOATY FOREVER! But yay, I love new voice actors in the series. I'm so happy that her and Michael are in the series and it's not some generic Anime voice actors brought in. We still have Travis Winngham and Matthew Mercier in the cast. Though Willingham has been doing more Western animation as of late. Anyways this is a cool find. Yeah but Travis is hot. And I didn't know he was confirmed?? IDK. If you wanna believe it, go ahead. Oh I don't think it's confirmed, but it sounds just like him. If it's not him I'll fully accept being wrong. Kingdom Hearts is owned by Disney at the end of the day, they can get big names like Leonard Nimoy (may his soul rest in peace) and Mark Hamill easily. And even with the "generic anime voice actors" for Kingdom Hearts, they're not generic, they're reliable and talented. Anyway, so glad to have another person confirmed to be in our lovely KH family. Can't wait to hear her in the actual movie. I'm sure she'll be great! Kingdom Hearts is owned by Disney at the end of the day, they can get big names like Leonard Nimoy (may his soul rest in peace) and Mark Hamill easily. And even with the "generic anime voice actors" for Kingdom Hearts, they're not generic, they're reliable and talented. Maybe so, but I prefer fresh over "in everything". That's why I enjoy this series. They get people who haven't done that much voice work. Final Fantasy XV will be the greatest video game ever constructed and released, and Kingsglaive will be the greatest movie every constructed and released. Did you see the season 6 finale of Game of Thrones? Lunafreya did that. She. Did. That.